The venue offers all sorts of rooms - single, double, 3-bed, with bathroom, or shared facilities. There are only 15 spaces for campers on the premises. Currently, late March, all room types are still available, except for double rooms with shared facilities. 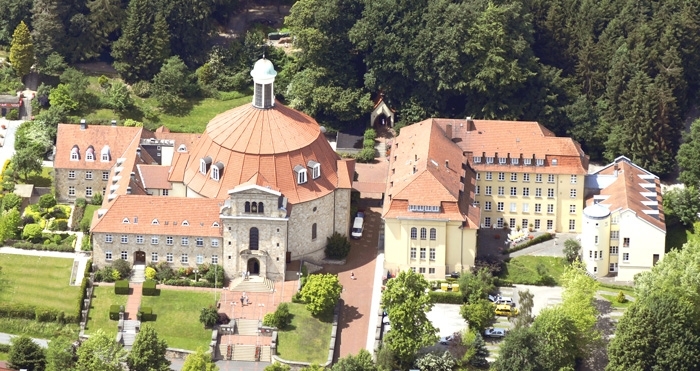 The venue is a former monastery where we were welcomed in 2014 already with great hospitality. Its location at the edge of a village allows for walking and cycling in the park-like landscape, making it at the same time conveniently reachable by public transport. The food is made with fresh, organic, seasonal products of regional origin. There is a choice of vegetarian dishes. Vegan food, as well as special diets, can be offered prior to the event.